Back on May 13 (which seems like a really, really, long time ago), I posted this article about the likelihood of seeing record disasters in 2015 because of the confluence of accelerating ice loss in the arctic and the emerging El Nino. For Texans, the article would have been prescient had it not been so general. The epic, record-smashing flooding we’ve seen in Texas over the last week, along with the tragic loss of life, is probably but a taste of the troubles that are coming during this El Nino. 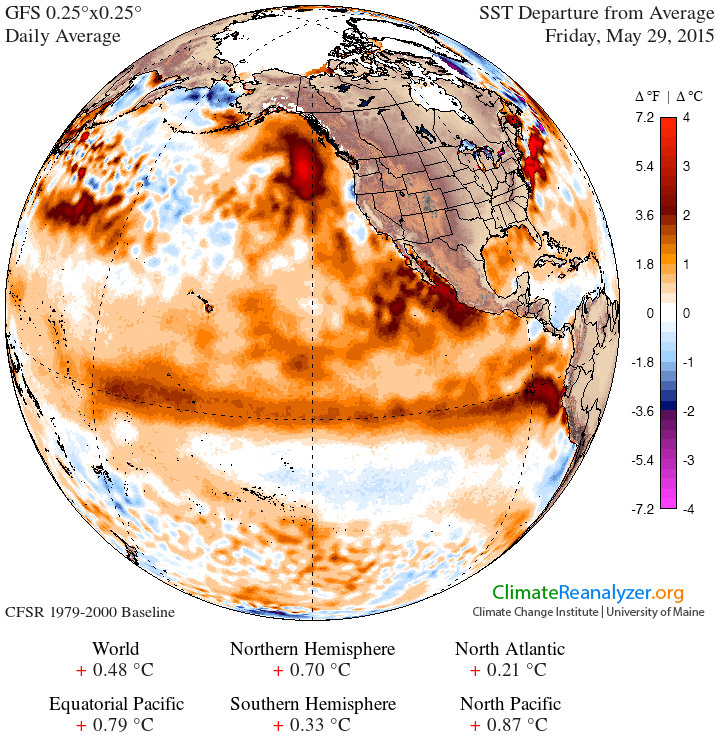 El Nino’s disrupt normal weather patterns globally, but it was not El Nino alone that pounded Texas. What we see in the eastern Pacific, off the coast of north America, is a massive and even unprecedented pool of abnormally warm water. El Nino, for all its disruptions, is nothing but a massive pool of warm water that moves from the area around Indonesia and Papua New Guinea to the cost of northern South America. And here is the thing: These two pools of abnormally warm water are now converging and all bets are off regarding their impact. Below is a sea temperature anomaly map (SST stands for Sea Surface Temperature) for today, and it clearly shows the elongated pool of warm water off the coast of the Americas. 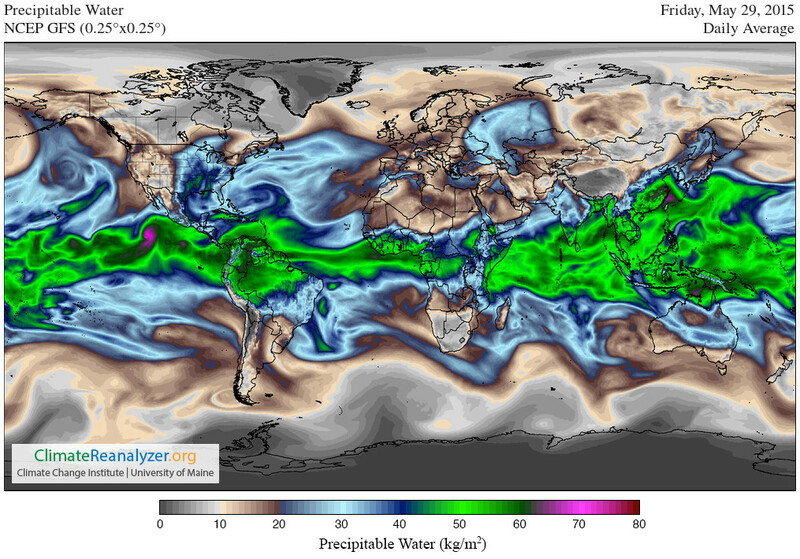 In the western and mid pacific you can seen a line of warm water making its way to the costs of Peru and Ecuador. Just to be clear, the accumulated energy represented by the warm water in the map below can warp global weather for months to come. It is a massive amount of energy that is being released from the ocean back into the atmosphere. Why is there a massive pool of abnormally warm water of the west coast of the Americas and why does it cause disasters? Good questions. The mass of abnormally warm water is there partly because it is the remnant of a pool that was almost an El Nino last year (this accounts for the southern end of the pool) and partly because the “ridiculously resilient ridge” of high pressure that has persisted off the coast of the US and Mexico for an unheard-of four years has allowed an excess of sun to heat surface waters to well above the norm. This, combined with a slowing of currents and surface winds, has allowed the masses of abnormally warm water to accumulate. The reason the ridge has persisted is the same reason that there have been changes in currents and surface winds: ice extent in the Arctic is at record lows. Stick with me here. The jet stream (high altitude winds) drives our weather. The northern hemisphere jet stream is in turn powered by the difference in temperature between the Arctic and the equator. As the Arctic heats up, there is less temperature difference between the Arctic and the equator and the jet stream slows down. You can see the incredibly weak and disorganized northern hemisphere jet stream reflected in the illustration below, which is from today. 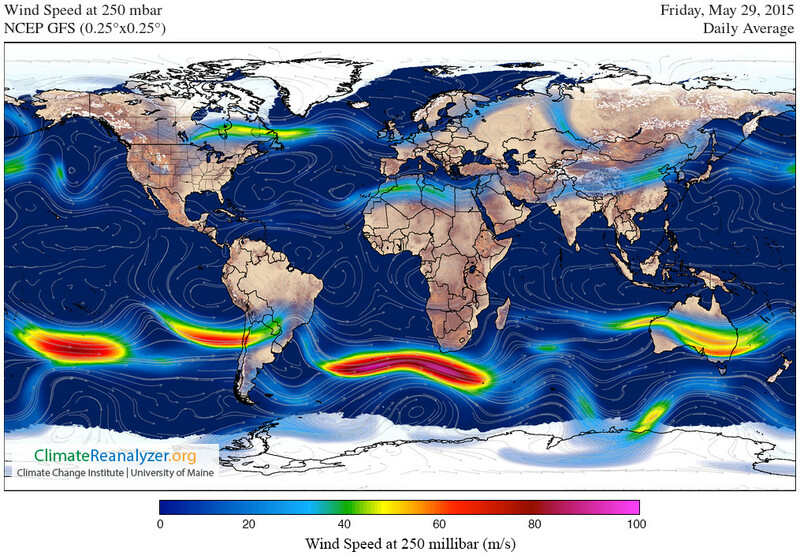 Note that the southern hemisphere jet stream is, for the moment, still robust while the northern hemisphere is a mere shadow of what it should be. What we see now is a summer monsoon storm season that is wildly more powerful than normal because of the evaporation of water caused by the heat pools in the eastern Pacific, including the building El Nino. That moist air flows over southern Mexico then shunts north, though Texas and into the central US, in part because the jet stream is not pushing it east as it would normally do. In this process, tropical levels of atmospheric moisture are brought far north, where they meet fronts of relatively cooler air, which causes rain to form in buckets. Below is a representation of levels of atmospheric humidity. Note that there are bands of moisture in the central US (dark blue and green) that are otherwise only found in the tropics on the map. Note also that the ridge of pressure of the western US coast is keeping all of the air over the western US very dry indeed. Note also that the one spot of really, really humid air (purple) is off the coast of Southern Mexico, right over one of the warm pools. What we are seeing is nothing less than the accelerating decline and failure of the earth’s global systems. This, in turn, is the logical (but not yet terminal) result of the introduction of sin into God’s perfect world. When man rebelled and decided to sin, Satan took man’s dominion over the world. In effect, creation was separated from Creator and a slow death of everything has been the result. Lately, that death process has accelerated dramatically and in turn the disruption of natural systems and human society–as predicted by Christ–has been in evidence. In Matthew 24 Christ Himself laid out for us what would happen in the end times. He was quite specific about the signs of the end, especially in Matthew 24:6-8. As we look at the decline in global systems and the subsequent impact on human society, we see that everything Christ predicted is tied to the accelerating progression of the effects of sin. We see, in effect, that the end is near and we see that the floods in Texas, in their own small way, fulfill prophecy and are meant as a warning to mankind. We also see that this is just the beginning–this is merely “the beginning of sorrows” (Matthew 24:8).